Magicka 2: Learn to Spell... Again! "Before I say anything about Magicka 2. I need to say that Magicka is probably one of my favorite games on PC of all time. 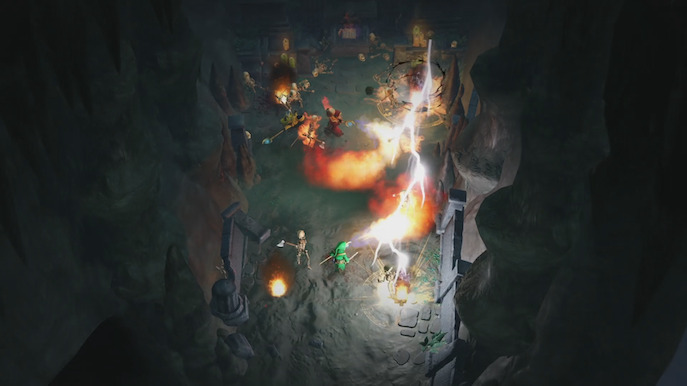 The franchise has growned bigger in quite a short time, releasing a mobile game and Wizard Wars. As soon as I learned that Paradox Interactive were releasing the long awaited sequel, I could not believe it. The first Magicka game had a charming campaign, and most (except the cosmetic stuff) of its downloadable content was brilliant, story-wise. 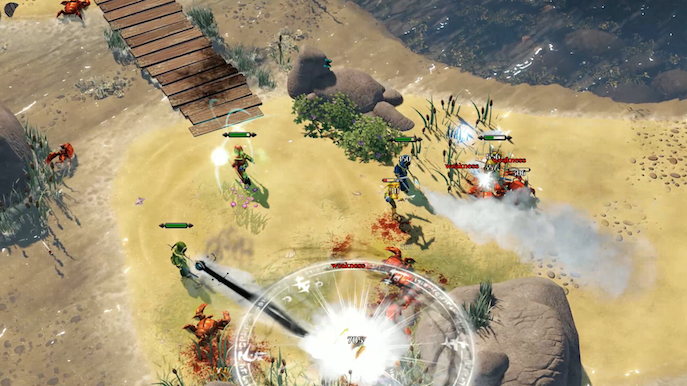 The Arrowhead Studios team didn’t not work on this sequel, so the new team, Pieces Interactive, steps in with a few new design ideas, some that are interesting to gameplay, but some that don’t specifically feel like…well, Magicka. 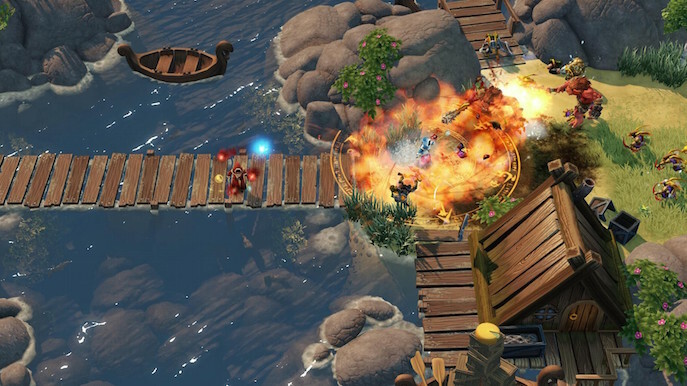 Tha Magicka franchise is always filled with humour; they way it connects with gameplay in “accident” managements. The story follows the aftermath of the Wizard Wars (sequel to Magicka 1), were basically Wizards around the world just started to not get a long and have discussions and started fighting each other in a grand scale war, just like Kindergarten, the objective of the game is to find a mystical child who is said to have amazing magical powers and is to be in charge of bringing balance to the world... Hopefully Shyamalan doesn't make a movie out of this. Any who, in the lore very few Wizards were left (the Revive spell loop hole is filled,the game mentiones that those revived Wizards were simply just decaying); You are one of the few that survived, as well as Vlad, your master and teacher, who guides you while he does totally not Vampire stuff. The story is not as long as you would want it to be, but again, even though I’m not a fan of massive releases of DLC, Paradox Interactive can offer very decent content to add to the lore. Also, the game has a lot of replayability on its side. I’d like to also add how delightful some of the writing is; usually you find NPCs chatting around about dumb topics, but if you stay they will just keep chatting on and on, surprising how much is writen on something that most players would ignore almost immediately. Oh did I mention the amount of references in media included? You have to find them obviously, but its nice to have that ingredient in. 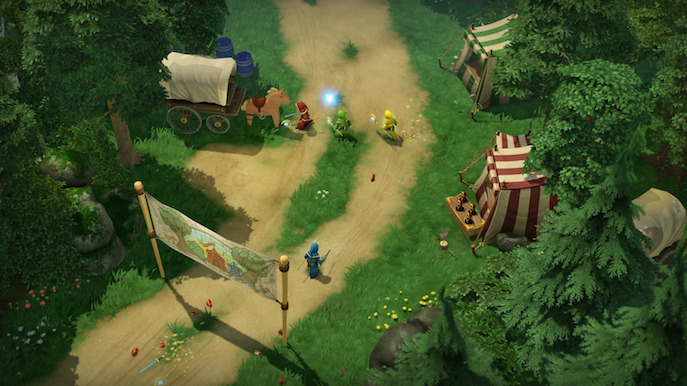 The thing that truly makes Magicka interesting is the way the player can interact with other players and enemies, specially the consequences of their acts on a very specific and determined time. The way you can mix your 8 different magical abilities can offer different results. Usually in the first game you would have to memorize some combos to perform special unique spells, now they are simply keybinded to single inputs (these include super running, Revive, the Push, an overwhelmingly powerful Dragon fire from above, and many more). The dynamic of gameplay can be a bit tricky, as if you control your character with the mouse while performing or casting spells can feel a bit slippery and out of control, forcing you to not only look at your target but look were your character is heading or heading into, causing many “accidents”. If you play alone you get revived once every few time by the annoying fairy that follows you, but if you play in Co-Op you can get revived and keep the flow of the game. I have to admit that while some new design traits are somewhat interesting, others are not quite as fun; some levels you encounter endless waves of enemies, only to know that for advancing you need to interact with something in a specific manner, yes this breaks the whole linear kill and advance thing, but in some situations the puzzles are not exactly clear. This game either enforces competitivity, or empowers friendship, but usually you want your friends to make levels easier, funnier, and to have them steal your weapons (…wait, what?). The camera perspective during different phases on a level is decently far enough, but if there are many players around its just a blob of colors and lightning shooting everywhere. Okay, but what about its cross platform shenanigans? Oh right! I have to admit that playing on a Mac seems quite nice, it plays a lot smoother somehow than the first game on PC (at least for me). Although the client feels somewhat buggy; usually when changing or messing around the graphic options the game just starts to collapse and your mouse begins to freak out, making pointing actions and character movement erratic and basically unplayable, forcing you to re-boot the game sometimes. So once you have a setting that works, I’d recommend sticking with it, there is enough craziness with controllers as it is. The cross platform feature works rather nicely, very few lag spikes but usually gameplay is very smooth, of course this isn’t a very demanding game, but for the franchise something like exploring other platforms is quite the evolution. I feel like the graphics are more clay-ish? The don’t feel very sharp, and you feel like everything has a different aesthetic (specially most of the character portraits and 3D models). Neverhteless, the art direction does a well job on showing different scenarios and contrasting them cleverly with your spells and “usually” your character’s clothing. The special FX are upgraded, they look and feel more powerful, more devastating, more…fun! 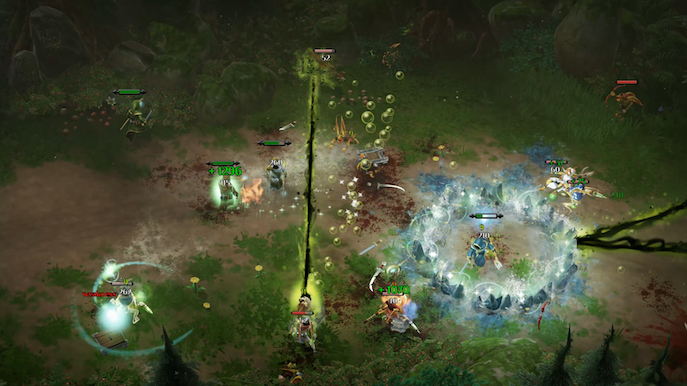 Other than that, there isn't much to say, it's Magicka, a game filled with color combinations. The mixing in the new soundtrack feels different, which I suppose is not wrong considering this is a sequel. You can feel most of the nice tunes from the original franchise but now having some awkward changes in the mix and balancing. Nevertheless, the music if pretty entertaining, relaxing, and has decent enough cues during different scenarios. If you're at the beach with wreckage ships, you get a nice pirate tune, if you're in a cave you get a mysterious deep tune, it's all very appropriate. *ALL RIGHT, BUT WHAT ARE YOUR THOUGHS?! 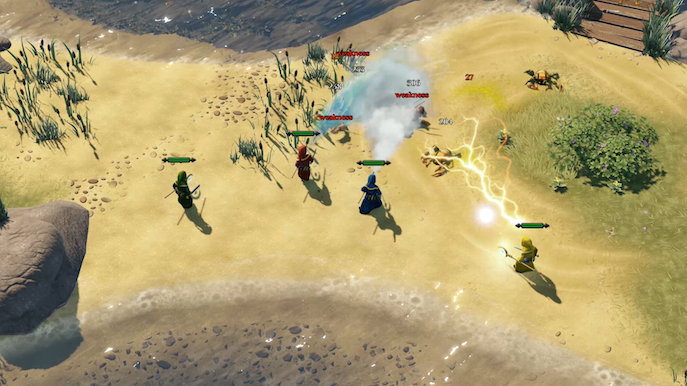 I have to say that the magic in Magicka 2 has faded off quite a lot. It is a Magicka game to a certain extent, but it lacks most of its crazy wacky stuff, and bugs that made Magicka 1 such a mess of fun and disaster. Yes, Magicka 2 can be a mess in gameplay, but it just feels flat. Either way, the game hopefully will have future content that improves its image. Furthermore, the game is pretty okay, but not MAGNIFICENT. - Difficulty scaling can get annoying, as if co-op wasen't hard as it is.